Italy defender Marco Materazzi will almost certainly miss Italy's upcoming game against France with a right thigh injury, and could be out for much longer. Materazzi underwent an hour-long surgical procedure at a hospital in Pavia on Thursday, his Inter Milan club said on its Web site without saying how long he would be out. Materazzi was hurt at the end of the first half during Italy's 3-1 loss to Hungary in a friendly Wednesday. Italy hosts France on Sept. 8 and travels to Ukraine four days later in Group B of European Championship qualifying. 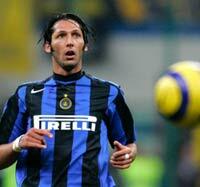 Materazzi is also expected to miss several games for Inter, which opens the Serie A season Sunday. The injury could be a costly one for Italy since defender Alessandro Nesta recently announced his retirement from international play. Andrea Barzagli is Materazzi's likely replacement to line up alongside Fabio Cannavaro in central defense.